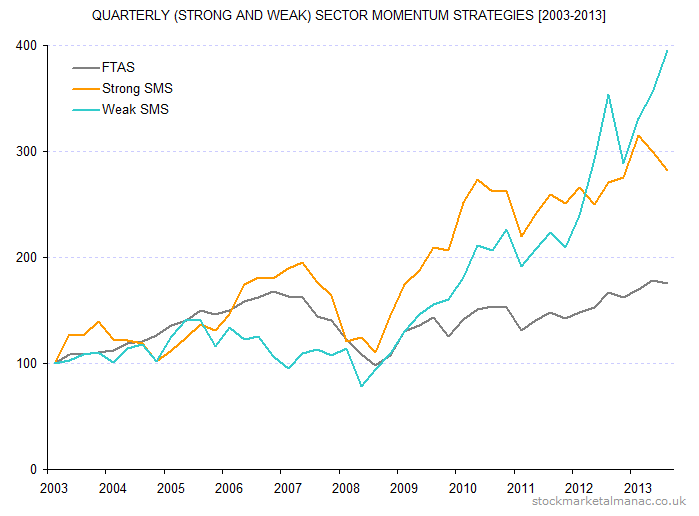 The following chart shows the performance of a portfolio that each quarter comprises just one FTSE 350 sector, that being the sector with the strongest performance in the previous quarter. So at the end of each quarter, the portfolio is liquidated and a 100% holding established in the strongest sector of the quarter just finished. This is held for three months, when the portfolio is re-balanced again. Each year there will therefore be four re-balancings. 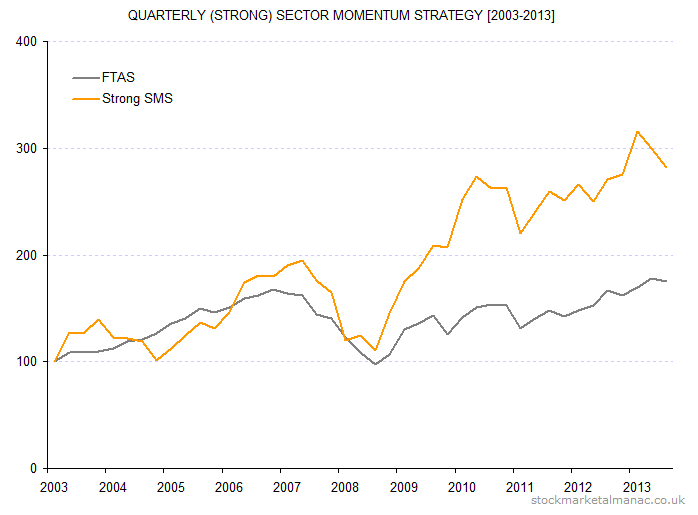 Only FTSE 350 sectors with at least three component companies are considered. The period studied was from 2003 to the first quarter 2014. In the chart below the portfolio (Strong SMS) is plotted against the FT All Share Index (FTAS) for comparison – both series are rebased to start at 100. As can be seen, the momentum strategy out-performed the index over the period of the study. However, it did so with greater volatility; the standard deviation of the portfolio’s quarterly returns was 0.12, against a comparable figure of 0.07 for the FTSE All Share Index. A refinement of the strategy would be to hold the two or three best performing sectors from the previous quarter instead of just the one (which would likely have the effect of reducing volatility). 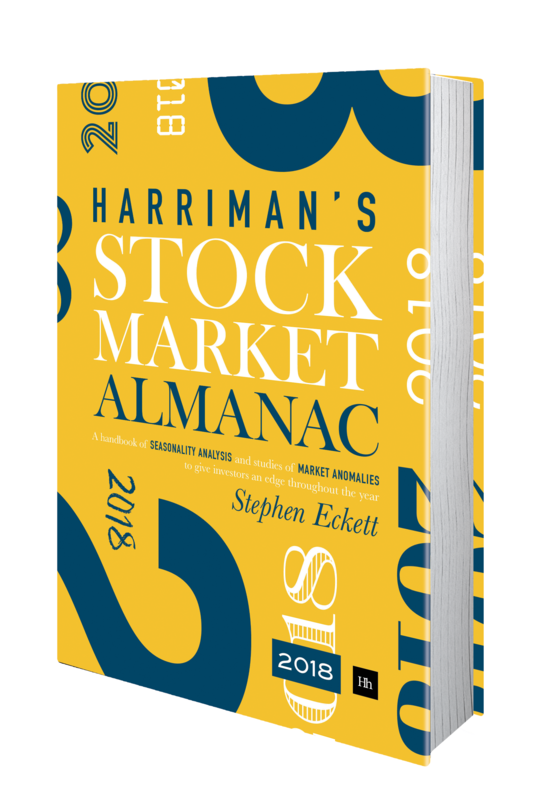 Other Almanac articles on momentum. 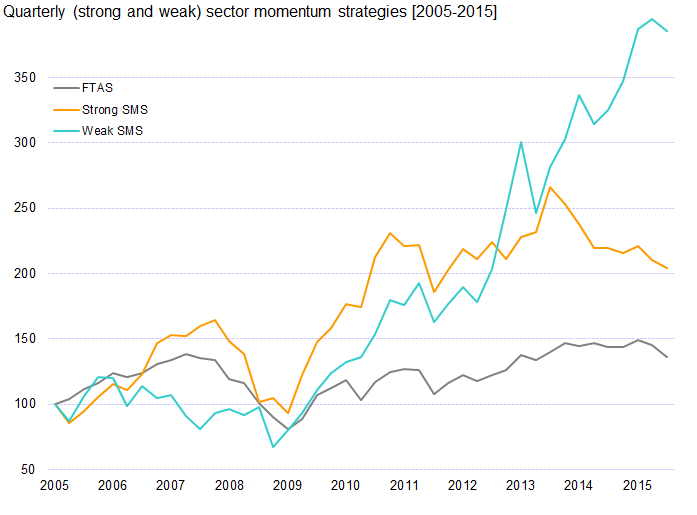 Interesting article by Dominic Picarda, The 20% a year UK momentum strategy, in which he uses Datastream super-sectors, holds two sectors each time and re-balances every month. And, The 20% a year momentum strategy: risk-lite edition, where he adds filters to only buy sectors when they have actually risen and when the market as a whole is strong. The table below displays the results of analysis on daily market momentum – the tendency of the market to increase one day, having also risen the previous day(s). The index analysed was the FTSE All-Share. The number of observations to September 2013 (from January 1969) was 11,284 days. The first row (“Total”) displays the number of consecutive days that the index rose. For example, the market rose 5967 days (out of the total 11,284); 3346 times it rose on 2 consecutive days; and 318 times it rose 6 days in a row. The second row (“% Total”) expresses the first row as a percentage of the total sample. For example, the market rose 6 days in a row 2.8% of the whole period (11,284 days). The rows “% 1 up” expresses the proportion of times that the market rose for n consecutive days following the market rising for 1 day (expressed as a percentage of the number of times the market rose once). For example: after the market had risen for 1 day, the market rose for a second day in 56.1% of all cases; after the market had risen for 1 day, the market went on to rise 6 days consecutively in 5.3% of all cases. The subsequent rows display the tendency of the market to rise following n consecutive increases. For example: after the market had risen 4 days consecutively, the market rose for a 5th day in 56.0% of all cases. Analysis for other frequencies (i.e. week, month, year) can be found in the Almanac. If we selected the 10 best performing FTSE 100 shares in one month and created an equally-weighted portfolio of those shares to hold for the following month, would that portfolio out-perform the market index? Or, more interestingly, if we did this systematically for a year (i.e. our portfolio each month is comprised of the 10 best performing shares in the previous month), would that portfolio out-perform the FTSE 100 Index? 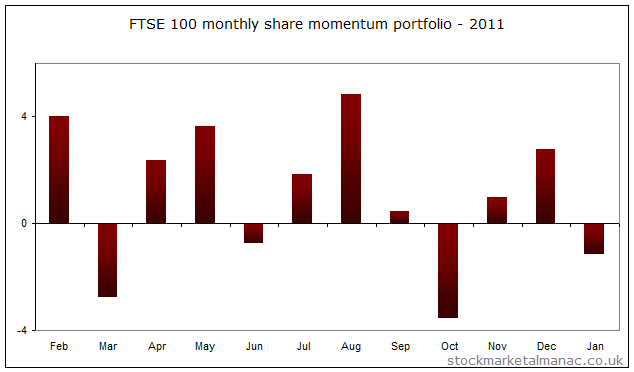 The chart below shows the result of operating such a momentum portfolio in 2011. Each bar represents the out-performance of the portfolio over the FTSE 100 Index. For example, in February the 10-share portfolio would have increased 6.2% against a FTSE 100 increase of 2.2%, giving an out-performance of 4.0. Over the year, the portfolio would have out-performed the index by an average 1.1 percentage points each month. At the end of the year the portfolio would have increased 10.3% on its starting value, while the FTSE 100 index fell 3.1% over the same period. The chart below illustrates the result of operating such a portfolio in 2010. 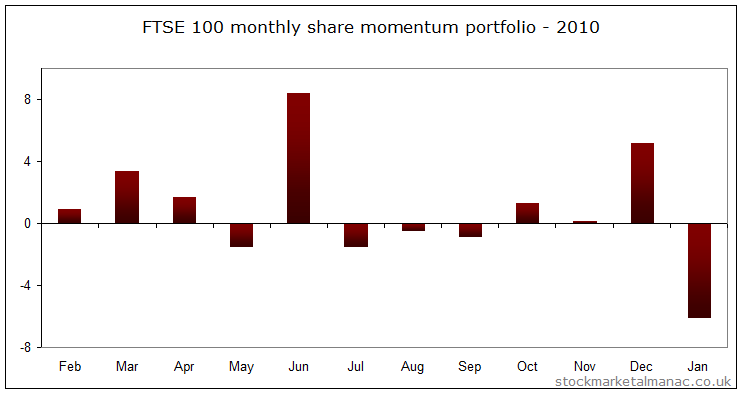 This time the average monthly out-performance of the portfolio over the FTSE 100 Index would have been 0.9%. Note: An academic paper published in 2001 looked at momentum trading strategies in the UK stock market. Although it identified several profitable strategies it found that momentum effects were not consistent and therefore the returns on the strategies were dependent on the period over which the strategies were applied.